The Urban Gallery manages the evolution of a planning project; it forms the incubator for prototype projects. It is an interactive planning tool use in dynamic master plans in which prototype projects play a significant role to either achieve efficient enerey management, link operations of very different sectors and stakeholders or create a pattern of sustained growth or evolution. The Urban Gallery is a tool that enables the stakeholders related to prototype projects to act jointly or collaborate over longer periods of time, and to develop, monitor and evaluate prototypes as pilot projects within an overall plan. The Urban Gallery is a public arena in which stakeholders meet and cooperate, but it is also a management tool for the knowledge and experience gained. 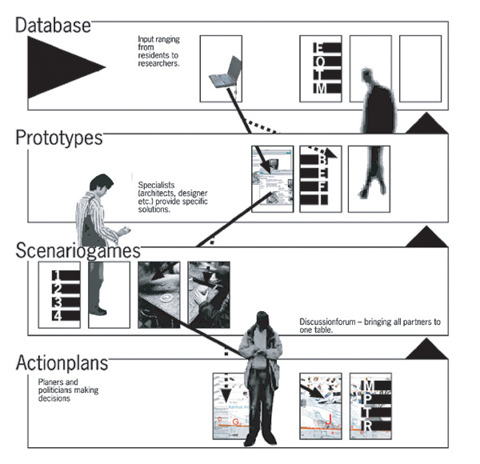 The structure of Urban Gallery consists of four main components: Database, Prototype, Scenario Game and Action Plan.